Rich Christian, Poor Christian: Is Meekness Really Weakness? I think a lot of people are really confused about the quality of meekness. They are under the assumption that if you have the quality of meekness, then you must be some kind of weak, nerdy dude or something. If you are meek then you must just cower in the corner and take all kinds of abuse from everybody. No, this is not exactly the correct portrait of meekness. 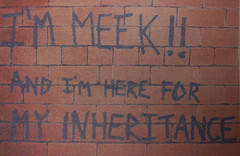 According to Merriam-Webster, to be meek is defined as enduring injury with patience and without resentment. Some words that are related to meekness are down-to-earth, lowly, humble, modest, unassuming, and unpretentious. Another popular definition of meekness reads strength under control. If you possess the quality of meekness, then when you are personally attacked, you have enough self-restraint to not lash out at those who are attacking you. You are able to maintain self-control through a difficult situation. In today's society, I would claim that this is a very rare character trait that is very seldom seen in everyday life. On most occasions, when people are attacked, they immediately have a knee jerk reaction and push back against their attackers. God's desire for His children is display the quality of meekness during times of adversity. What Does God's Word Say About Meekness? Meekness is a quality that is held up in God's Word as an ideal, worthy personality trait and addressed in several passages of Scripture. When Jesus preached the Sermon on the Mount, He mentioned in Matthew 5:5, Blessed are the meek: for they shall inherit the earth. In a listing of the fruit of the Spirit in Galatians 5:22-23, we read, But the fruit of the Spirit is love, joy, peace, forbearance, kindness, goodness, faithfulness, gentleness and self-control. Against such things there is no law. The last two fruit in this list, gentleness and self-control, are the exact same qualities that are displayed in meekness. In fact, the King James Version interprets this as meekness. Moses was considered to be the meekest man ever to live. Numbers 12:3 states, Now the man Moses was very meek, above all the men which were upon the face of the earth. Moses was also God's friend who probably had the most intimate relationship with God of any human being. But Moses was no push over. He leaned on God for his strength during difficult times as he lead the Israelite people through the desert on their way to the Promised Land. On His journey to the cross, Christ Himself demonstrated the quality of meekness - strength under control. At any time, He could have called legions of angels to rescue Him from his capture by the religious leaders, as well as the beatings and crucifixion that followed. He could have called out to God the Father, who could have sent fire from heaven to consume His enemies or opened up the earth under their feet and swallowed them up. Instead, He remained silent. He endured the beatings and crucifixion for our sake. He demonstrated incredible strength by remaining in control of His emotions. How Can You Demonstrate Meekness In Everyday Life? When I consider a modern day example of meekness in today's world, I think of former President George W. Bush. Love him or hate him, he definitely possess the unique quality of meekness. As President, he was beat up about his faith, his family, his policies, about his pronunciation of words, and so on. You name it, his critics criticized him about everything. But what did George Bush do when he was personally attacked? For the most part, he displayed great strength under control through staying silent, ignoring his critics, staying true to his personal convictions and faith in Almighty God, and leading the country through a very difficult time period following the attack on 9/11. If you are a leader of anything, whether it be your family, a company, a Bible study class, or a church, then there's a good chance you're going to get criticized. Our natural, fleshly response is to push back and attack those who are attacking us. I know firsthand how easy it is - I've been there and got the t-shirt. The next time you're attacked, though, try something different. Just ignore your critics. Lashing out at your attackers just fuels the fire, anyway. Display the fruit of the Spirit by living with an attitude of meekness. At the end of the day, you're going to come across as the mature, intelligent individual while your critics won't. More importantly, you will make God smile. You will display growth in your walk with Him.